Whether you take your shower at the beginning or the end of your day, odds are, it’s one of the best things you do for yourself. It’s refreshing and relaxing… or at least it should be. But maybe you’re knocking over bottles of conditioner while trying to reach for your body scrub. Perhaps your shaving gel leaves a rusty ring and it’s ruining the look of your shower. Not so relaxing, right? 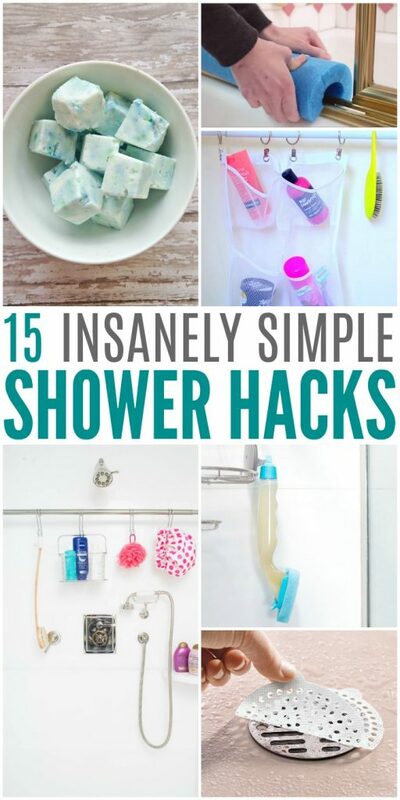 Well, lucky for you, we’ve found some shower hacks to take care of everything from less hair in the drain to creating a more inviting, relaxing shower experience. 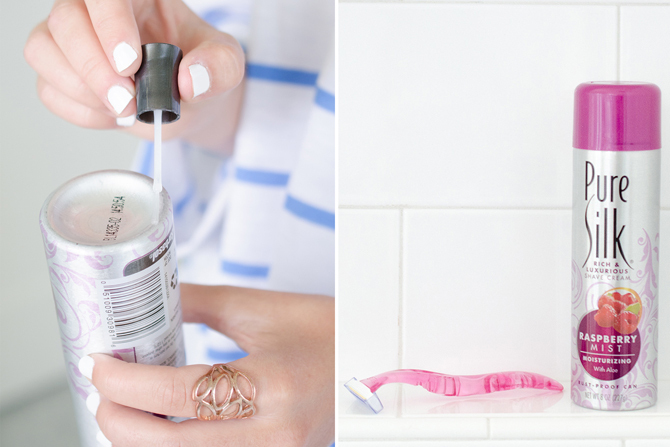 Keep your shower clean in just a minute or two a day with this DIY shower cleaning wand. No more scrubbing after weeks of letting it get dirty! Get more shower cleaning tips to keep it sparkling. Brush long hair first before showering to reduce hair in the floor and icky clogged drains. Speaking of long hair, if you have it, you need these disposable hair traps. They’ll save you some serious cleaning and unclogging time. 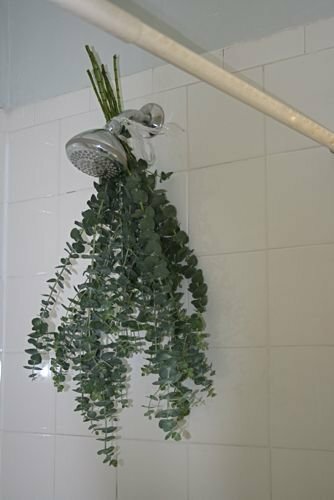 Tie sprigs of eucalyptus to the shower head to invigorate your showers. It smells clean and fresh and helps you relax. 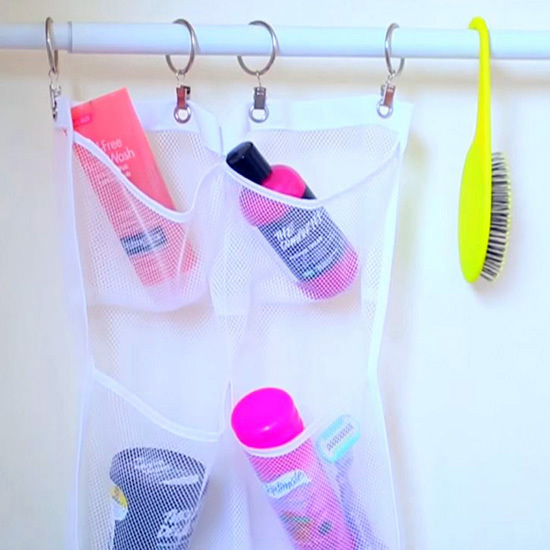 Install a second shower curtain rod in the back of the shower to hang your products from. After all, what girl only has one type of shampoo or conditioner? 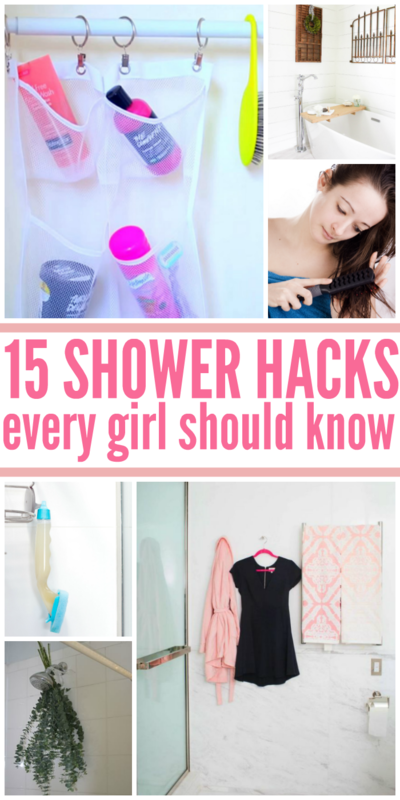 Your shower will love these! Really! Make your water come out of your shower head cleaner, the grout become brighter and your door sparkle, all with the help of vinegar and baking soda! Does your hair suffer from major frizz? 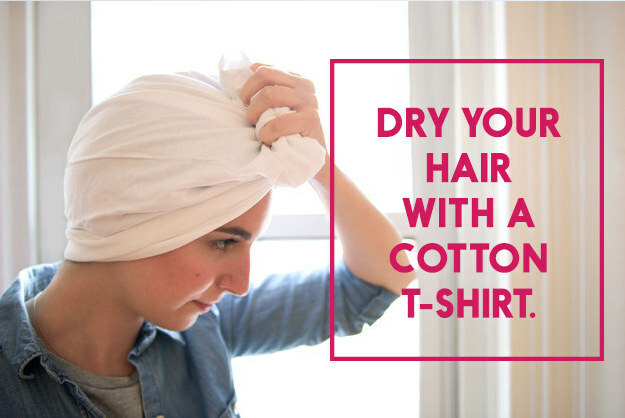 Start drying it with a cotton t-shirt instead of a terrycloth towel. The towels cause way too much friction which, in turn, results in a frizzy head. Hang an over-the-door shoe organizer to hold your products. 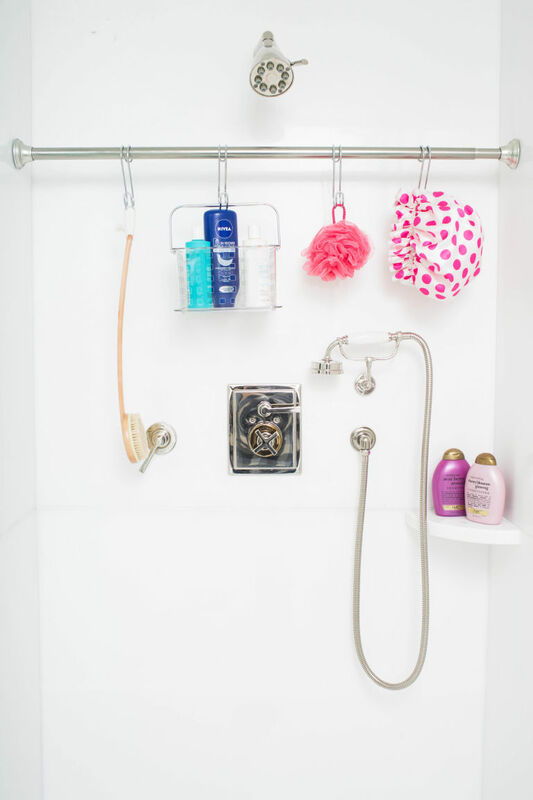 You’ll never go back to those tiny shower caddies again. 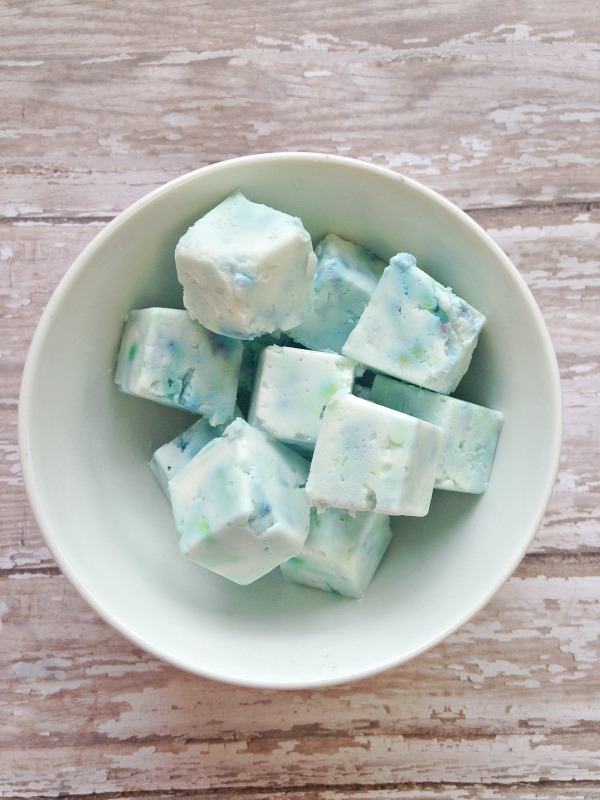 When you’re stuffy and congested, these homemade vapor rub shower cubes will save the day. Ahhh, nothing feels better than breathing easier after a hot, steamy shower! Keep rust out of your shower by painting the bottom of your shaving cream with clear nail polish before sitting it down. 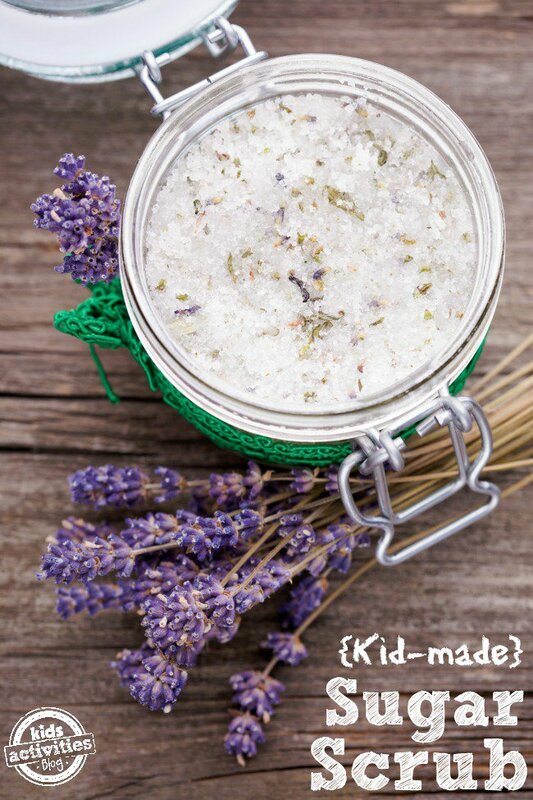 Smell great and get silky smooth skin with a homemade sugar scrub recipe. Make sure you clean the floor out after you’re done, as some can make the shower quite slick. 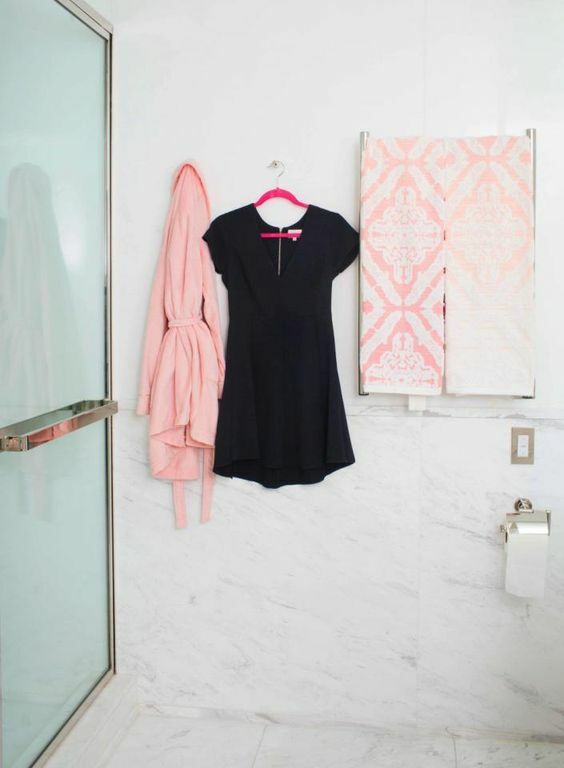 Hang wrinkled clothes in the bathroom while you shower. The steam will help release some of the wrinkles, making your clothes look neater. Cool time saver! 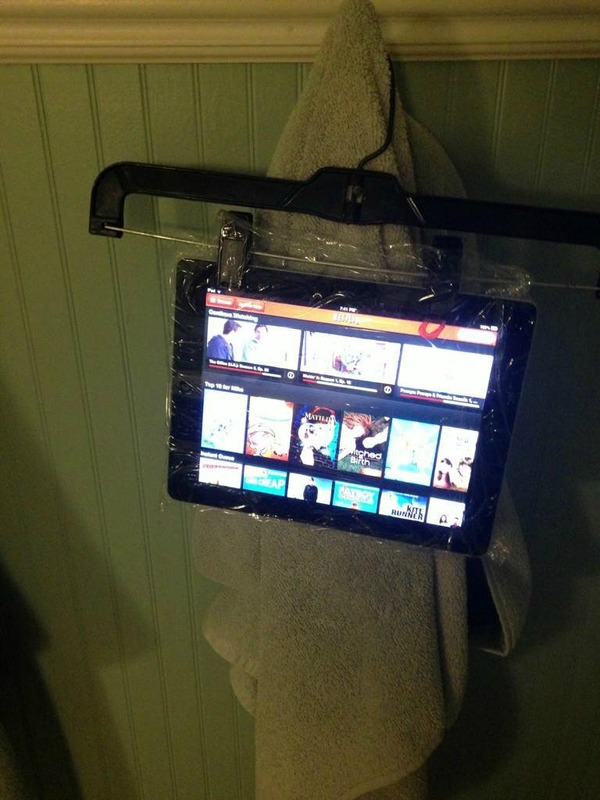 Want to watch Netflix in the shower? Come on, we know you’ve thought about it. Put your phone or tablet in a Ziploc bag and hang it up. 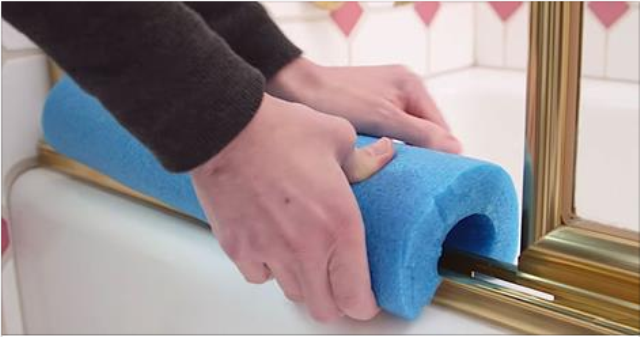 Make bath time safer for the littles by placing a pool noodle over the shower door track. As someone with short legs, I can’t tell you how many times I’ve scuffed myself getting in and out of the shower, so this tip is definitely a good one! And if you feel like taking a relaxing bath instead of a shower, you just haven’t lived till you have a drink, a good book (and maybe even some chocolates) on a DIY bathtub tray. Does your shower curtain liner always get mildew at the bottom? It may be too long. Trim your shower curtain liners so that they hang near the bottom without actually pooling in the bottom of the tub.